Color management used to be a task only the most exclusive publishing houses, service bureaus and print shops dealt with. As designers, we accepted the results those companies gave us, because we had no control over it, nor the knowledge or tools to do it ourselves. But today, color management is not only easier to do, it is almost a requirement for designers to maintain control over the appearance of their work once it’s published and, ultimately, keep clients happy. I recently had a conversation with Andy Hatkoff, Vice President of OEM and technology licensing, at Pantone. Andy is in charge of making sure that hardware and software companies can successfully integrate the Pantone Color System into their digital color workflow. This encompasses graphic design, print, publishing, fashion design and product lifecycle management solution providers such as Adobe, Microsoft, Quark, HP, Xerox, Ricoh, and many other companies where color plays a critical role. In the following Q&A, we talk about how color management has changed and what tools creative pros can use to get the best results. Color management has changed a lot over the past 10 to 12 years, yes? Hatkoff: It’s become more accessible than it has in the past—it’s no longer the realm of just a few practitioners and color gurus, and you don’t have to spend thousands of dollars and have a degree in color science. Creatives of all types are now able to effectively manage color, whether designing for print, the Web, or even textiles. For $89, you can get a product like the Pantone Huey that will calibrate and profile your monitor. 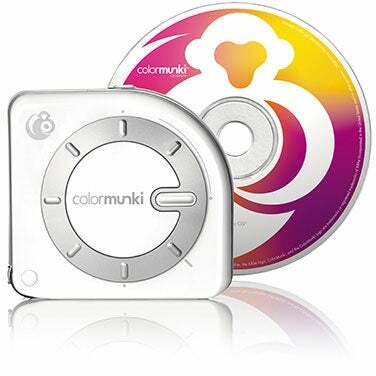 For even greater control, you can get a Pantone ColorMunki Design for under $500, which can perform monitor and printer profiling, as well as capture accurate colors from virtually any substrate. 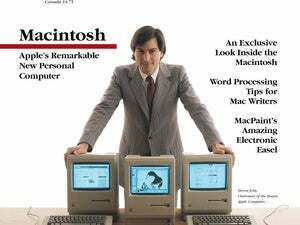 This kind of control by a designer or photographer was but a dream just a decade or so ago. While color management has become more widespread and accessible, there are still many pitfalls that make it problematic, are there not? Hatkoff: Designers and creatives want to focus on design and not worry about color management, so the best processes are transparent to the user and should occur smoothly—create your settings once at the OS level and be done with it. But you still need to know how and where to apply profiles based on workflow and, in some cases, will actually need to turn color management off in order to make it work. Giant strides have been made in making color management viable—the challenge is to make it so easy and straightforward that you don’t even know it’s there. When not applied properly, color management can be frustrating, and make even the most experienced designer break down and cry. But the tools, techniques and processes provide a much better correlation between what you see on-screen and what the inkjet printer or commercial press will produce when used properly. As with any tool or technology, the key is to use it correctly. Are most designers and photographers you’ve come across managing color properly in their digital workflow? Hatkoff: I don’t know about most, but I know of a lot of designers that still don’t calibrate their monitors. This is a basic first step—if you don’t do it, then color management simply won’t work. The thing is, profiling your monitor is easy, and the current tools are inexpensive and only take a couple of minutes to set up. What tools are available that can bring this rocket-science technology we call color-management down to Earth for the average designer or photographer? Are Pantone swatch books enough? Hatkoff: Pantone swatch books help you predict color on an offset printing press. The Pantone Color Bridge and GoeBridge guides allow you to see what happens when you print a Pantone color in 4-color process instead of a spot color. But they’re just one step in the whole process. What about the tools provided on the typical designer or photographer’s Mac? Hatkoff: Apple and Adobe have made real inroads in advocating and advancing the use of color management with OSX and the Adobe Creative Suite applications. The user experience is improved when you can trust what you see on-screen and have that match the output. It brings the promise of WYSIWYG that much closer to reality. 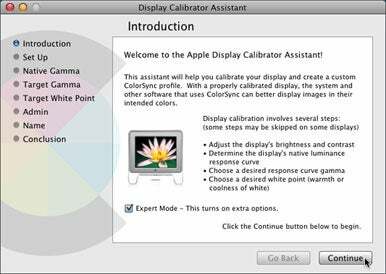 The built-in tools like the Apple Display Calibration Assistant and Adobe Gamma will tune your monitor through a visual process. But their effectiveness depends on the visual acuity of the user, so it’s hit or miss. Though they are free, if color is important in your work I would recommend spending a few bucks for a colorimeter (a device that will measure color for you). These are more accurate and trustworthy than visually-based solutions. It’s kind of like trying to tune-up your car if you’re not mechanically inclined, or paying a mechanic to do the work and know it’s done correctly. Beyond the apps that ship with OSX and Adobe Creative Suite, what can a designer or photographer do to get the best results with their color? Hatkoff: As I’ve said earlier, at the most basic level you need a tool to calibrate your monitor. Most modern LCDs and CRT monitors come with color profiles, and my advice is to make sure you use them. Also, if you use a wide variety of paper that doesn’t come from the printer vendor, you might want to invest in a printer profiling tool, as it can profile a wider variety of paper. If you use third party inks, then you must profile your printer, as the “canned” profiles that ship with most printers are built using the manufacturers’ inks and papers. The Pantone ColorMunki Design I mentioned earlier can do this for you. One important thing that most designers and photographers forget is viewing conditions – the lighting under which you evaluate color. Office or fluorescent lighting is not a good light source for evaluating colors. Typically you will want D50 or D65 standards, which simulate average daylight. Think about how lighting effects color – in a store, a garment can look entirely different than it does outside. Bottom line is, you must standardize how you evaluate color. What about the output? I print the same files to my office inkjet, large format printer, and commercial printing presses. What can I do to assure that the output looks the same on all of them? Hatkoff: Boy, this question requires me to take a sip from my Pantone 355 coffee mug and don my geek beanie, as we’re going into deep, dark territory here. There’s no one simple answer to this question, as it depends on your workflow and whether or not you use a RIP [Raster Image Processor—typically used by commercial print shops to output digital files to film, plate or directly to press]. A few methodologies can help solve this problem, all of which require good profiles for all the devices in the chain. And you’ll also need to make sure that the proof you’re printing on your inkjet printer at the office is done on the same, or as close as possible, paper that will be used for the final press run. This alone is generally a huge obstacle. First, there are profile settings called source and destination—the source profile is the printer you want to match to, so if you want your inkjet printer to match your press, you use your press profile as the source profile and the inkjet printer as the destination profile. Real intuitive, eh? The second step is a bit more logical, but requires a RIP. If you aren’t using a RIP, there should be a setting called Simulation—in the case of matching your press, the destination or printer profile would be the inkjet profile and the simulation profile would be set to the press. Any final advice you have for designers and photographers? Hatkoff: If you’re cash-strapped—and who isn’t these days—then use the free tools like Adobe Gamma or the Apple Display calibration tools to tune your monitor at the very least. You can also use the free canned profiles that ship with your monitor and printer. But most importantly, remember that matching your final print to the display is notoriously difficult, so don’t expect perfect results when you calibrate visually. While I can’t sing the praises of the Pantone ColorMunki Design enough—I really hated to return the demo unit I used to write my overview article this past December—you still need a deeper understanding of how to use color profiles in your design workflow. Because the subject of color-management is difficult to wrap your brain around, finding help isn’t as easy as it probably should be. But I have found one particular site that is most helpful in making color management easy to understand for the average Adobe Creative Suite app user. Gary Ballard offers an exhaustive amount of information and tips about color managing your workflow at his Web site. You can start with his rundown of monitor calibration. You can also check out Adobe’s Color Management discussion forum, where you can find answers to your questions.